While it may be a basic accessory, pooper scoopers’ role can’t be ignored. Imagine having to scrape poop using a polyethylene bag, bending all the time, or trying to gather the waste in a grassy or gravel area? Chances are you will miss lots of poop; feel disgusted having to go so near it, or even end up with an aching back because of bending over too often. The good news though is that you can collect poop with minimal inconvenience. What you need is a good scooper for poop. It comes in a user-friendly design, collects the entire poop, and can be used in different terrains including grass, concrete, asphalt (tarmac), dirt and more. One of the issues, however, that people face is determining which product they should go for. This comes at a time when all kinds of products can be found in the market. In these top 10 best pooper scoopers in 2019, we will not only list the best items but also show you how to pick a good item. Length: It should come in the right size to avoid bending or stretching your back too much. Weight: A good item isn’t too heavy or too light. Although a bulky piece may gather more poop, it may be harder to operate. A small one will only collect a little poop. Ergonomics: The accessory should be friendly to the user. It should be easy to use, comfortable and the handle should also provide a firm grip. Easy to operate: Opening and closing the jaws or sweeping the poop in the collecting piece should be easy. The right item will come in a simple mechanism that operates flawlessly. For instance, most jaw-type scoopers will shut automatically when the handle is released. 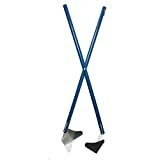 Versatility: Good poop scoopers works on different surfaces including grass, dirt, concrete, asphalt, gravel and wood. 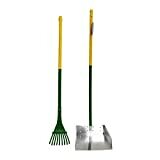 Scooping waste is more convenient with this rake set by Four Paws. The small unit measures 7 x 7 x 3 inches while the large one is 9.5 x 10 x 3 inches. It’s made from sturdy material that is resistant to wear and tear and can be used on different surfaces including grass, concrete, and dirt. In addition to being simple, the scooper is also sanitary. Those looking for reliable, sanitary and practical pooper scoopers should consider this item from Four Paws. It comes in a simple design for easy collection and is made from sturdy plastic that doesn’t rust or corrode. The handle is constructed out of light aluminum and features a smooth finish while the handle comes with a comfortable rubber grip. Any serious dog owner will appreciate the OxGord Jumbo poop scooper. It comes in a large size for gathering more poops in a single scoop. The handle is made from quality aluminum while the bottom section is crafted from strong plastic. It’s ergonomically designed for easy use and convenience and doesn’t require the use of plastic doggie bags. The Petphabet Easy Patrol is one of the best pooper scoopers in the market. It comes in either medium or large size and is available in 7 different colors. The unit is known for its dual-recoil tension controlled mechanism that uses minimal effort to collect poop. It comes with a comfortable firm grip handle that when squeezed opens the jaws. It’s designed for use on grass, dirt, concrete, snow, gravel, cement and other places. 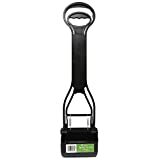 The Wee-Wee Allen’s Spring-Action scooper from the Four Brand is a common choice for many dog owners. It’s made from plastic and comes in a one-handed design. The accessory features a comfortable handle that offers a firm grip and can be used on both soft and hard surfaces. Scooping dog poop will be less strenuous once you get the Bodhi dog pooper scooper. It comes as a complete kit and includes a set of bags and holder. Made from premium lightweight plastic and featuring two high tension springs, the unit’s jaws open by pressing the handle and automatically close when released. To ensure no poop falls or is left behind, it comes with a unique bucket-teeth pattern. Proper pet waste management is what this accessory seeks to offer. It consists of a large capacity swivel bin and a slender handle both of which contribute to the unit’s effectiveness. It’s made using sturdy materials that resist wearing, staining, rust or corrosion. To provide proper grip, the ergonomic handle is well designed and smooth. 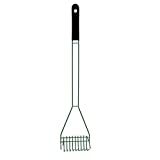 Your search for a good dog poop scooper will end when you acquire the Wire Rake Scooper by Four Paws. It’s loved for its simplicity, quick cleanup, and good capacity. It’s designed for the lawn and comes with a rust-resistant wire rake that will scrape pop from inside the grass. For improved comfort, the unit features a rubber grip. 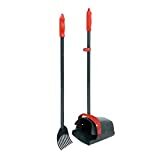 Featuring a swivel bin and rake, the Arm & Hammer scooper is fit for cleaning dog poop from the yard. It boasts of a large-capacity bin that can handle high volumes and doesn’t need frequent emptying. And for improved performance, the bin can swivel from side to side. The ergonomic handle is easy on the hand and can be extended up to 32 inches. Nature’s Miracle Jaw Scoop is respected for its simplicity and user-friendly nature. It can easily pick scoop from a range of surfaces with little effort. This is made possible by the jumbo-sized bin, cross locking jaws, and ergonomic handle. It’s made out of nonstick plastic and comes with antimicrobial product protection. Collecting poop on grass, soil, concrete, asphalt, gravel or any other place doesn’t need to be challenging. You shouldn’t strain or risk injuring your back because of frequent bending. You also shouldn’t risk touching poop or leaving some behind because the accessory doesn’t work well. What you deserve is an accessory that will gather all poops easily, conveniently and effortlessly. It will work on any surfaces whether flat or sloppy, is ergonomically designed for maximum grip and comfort, and lasts for a long time. We looked around, compared and managed to identify the best accessories on the market. 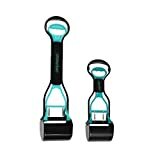 Follow these top 10 best pooper scoopers in 2019 reviews and have an easier time clearing poop.